Time is the most critical factor that decides whether a business will rise or fall. That’s why we see sales in stores and e-commerce platforms aligning with festivals. These businesses analyze years of spending data to understand the best time to throw open the gates and see an increase in consumer spending. But how can you, as a data scientist, perform this analysis? Don’t worry, you don’t need to build a time machine! Time Series modeling is a powerful technique that acts as a gateway to understanding and forecasting trends and patterns. But even a time series model has different facets. Most of the examples we see on the web deal with univariate time series. Unfortunately, real-world use cases don’t work like that. There are multiple variables at play, and handling all of them at the same time is where a data scientist will earn his worth. In this article, we will understand what a multivariate time series is, and how to deal with it. We will also take a case study and implement it in Python to give you a practical understanding of the subject. Why Do We Need VAR? But I’ll give you a quick refresher of what a univariate time series is, before going into the details of a multivariate time series. Let’s look at them one by one to understand the difference. A univariate time series, as the name suggests, is a series with a single time-dependent variable. For example, have a look at the sample dataset below that consists of the temperature values (each hour), for the past 2 years. Here, temperature is the dependent variable (dependent on Time). If we are asked to predict the temperature for the next few days, we will look at the past values and try to gauge and extract a pattern. We would notice that the temperature is lower in the morning and at night, while peaking in the afternoon. Also if you have data for the past few years, you would observe that it is colder during the months of November to January, while being comparatively hotter in April to June. Such observations will help us in predicting future values. Did you notice that we used only one variable (the temperature of the past 2 years,)? Therefore, this is called Univariate Time Series Analysis/Forecasting. A Multivariate time series has more than one time-dependent variable. Each variable depends not only on its past values but also has some dependency on other variables. This dependency is used for forecasting future values. Sounds complicated? Let me explain. Now that we understand what a multivariate time series looks like, let us understand how can we use it to build a forecast. 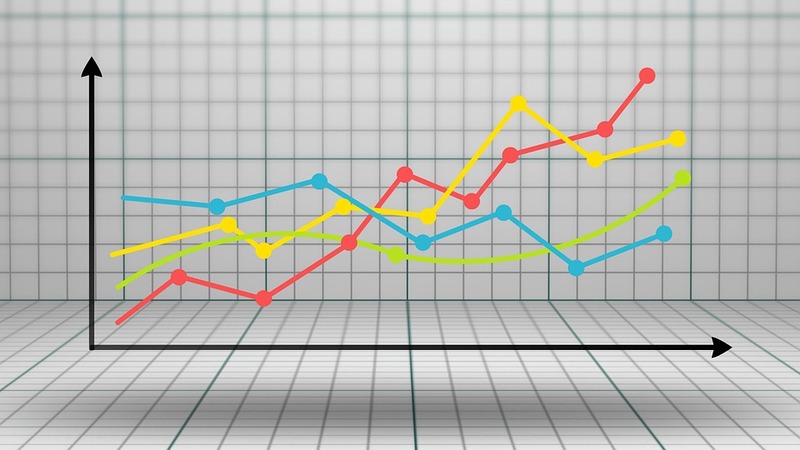 In this section, I will introduce you to one of the most commonly used methods for multivariate time series forecasting – Vector Auto Regression (VAR). 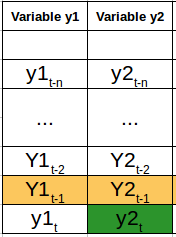 We have two variables, y1 and y2. We need to forecast the value of these two variables at time t, from the given data for past n values. For simplicity, I have considered the lag value to be 1. 3. Why Do We Need VAR? Recall the temperate forecasting example we saw earlier. An argument can be made for it to be treated as a multiple univariate series. We can solve it using simple univariate forecasting methods like AR. Since the aim is to predict the temperature, we can simply remove the other variables (except temperature) and fit a model on the remaining univariate series. 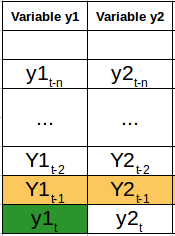 Another simple idea is to forecast values for each series individually using the techniques we already know. This would make the work extremely straightforward! Then why should you learn another forecasting technique? Isn’t this topic complicated enough already? From the above equations (1) and (2), it is clear that each variable is using the past values of every variable to make the predictions. Unlike AR, VAR is able to understand and use the relationship between several variables. This is useful for describing the dynamic behavior of the data and also provides better forecasting results. Additionally, implementing VAR is as simple as using any other univariate technique (which you will see in the last section). We know from studying the univariate concept that a stationary time series will more often than not give us a better set of predictions. If you are not familiar with the concept of stationarity, please go through this article first: A Gentle Introduction to handling non-stationary Time Series. Note: I is the identity matrix. Similar to the Augmented Dickey-Fuller test for univariate series, we have Johansen’s test for checking the stationarity of any multivariate time series data. We will see how to perform the test in the last section of this article. If you have worked with univariate time series data before, you’ll be aware of the train-validation sets. The idea of creating a validation set is to analyze the performance of the model before using it for making predictions. Creating a validation set for time series problems is tricky because we have to take into account the time component. One cannot directly use the train_test_split or k-fold validation since this will disrupt the pattern in the series. The validation set should be created considering the date and time values. 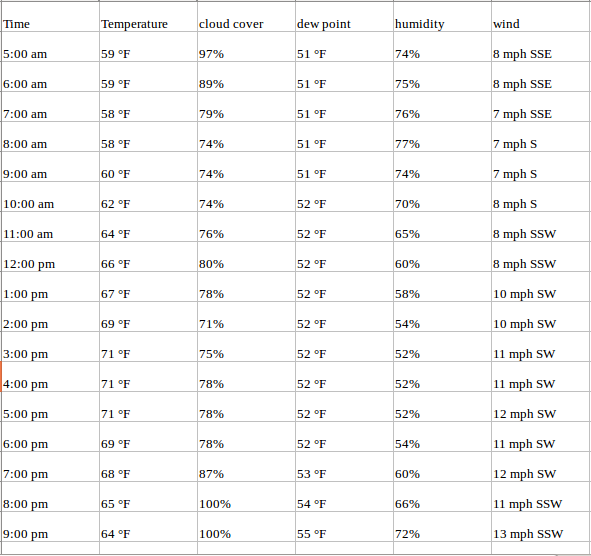 Suppose we have to forecast the temperate, dew point, cloud percent, etc. for the next two months using data from the last two years. One possible method is to keep the data for the last two months aside and train the model on the remaining 22 months. Once the model has been trained, we can use it to make predictions on the validation set. Based on these predictions and the actual values, we can check how well the model performed, and the variables for which the model did not do so well. And for making the final prediction, use the complete dataset (combine the train and validation sets). In this section, we will implement the Vector AR model on a toy dataset. I have used the Air Quality dataset for this and you can download it from here. The next step is to deal with the missing values. Since the missing values in the data are replaced with a value -200, we will have to impute the missing value with a better number. Consider this – if the present dew point value is missing, we can safely assume that it will be close to the value of the previous hour. Makes sense, right? Here, I will impute -200 with the previous value. You can choose to substitute the value using the average of a few previous values, or the value at the same time on the previous day (you can share your idea(s) of imputing missing values in the comments section below). The predictions are in the form of an array, where each list represents the predictions of the row. We will transform this into a more presentable format. Before I started this article, the idea of working with a multivariate time series seemed daunting in its scope. It is a complex topic, so take your time in understanding the details. The best way to learn is to practice, and so I hope the above Python implemenattion will be useful for you. I enocurage you to use this approach on a dataset of your choice. This will further cement your understanding of this complex yet highly useful topic. If you have any suggestions or queries, share them in the comments section. Building DataHack Summit 2018 – India’s Most Advanced AI Conference. Are you Ready? The Winning Approaches from codeFest 2018 – NLP, Computer Vision and Machine Learning! HI. Thanks for sharing the knowledge and the great article! Could you pls add some details regarding the stationarity test process described in the article : the test is done and the results are presented but it is not clear if it could be concluded that the data is stationary; after the test is done no further actions to make the data stationary are performed…why so. Why not just use Random Forest for this? Hi John, random forest can be used for supervised machine learning algorithms. In this case, we don’t have a test set. Considering the example for weather prediction used in section 1 -if you consider temperature as target variable and the rest as independent variables, the test set must have the independent variables, which is not the case here. Using VAR , we predict all the variables . Hi Alex, under the stationarity section, we understood that if the modulus of eigenvalues are less than 1, the series would be classified as stationary. While implementation, since the condition is satisfied, I have not performed any transformation on the series. There is a complete article that describes dealing with non stationary time series (link provided in this article). I have to face the same type of problem. I have one target variable and other rests of variables are independent. Data is given day to day time series observation. Now I want to forecast the target variable for the next three months. It is helpful if you share this type of article. There are a number of articles out these which cover this concept. You can use Algorithms like LSTM, or build two different models and combine the predictions. Hi , I have applied the coint_johansen on my dataset. But , since most of the dependent variables are 0 , I am getting Singular Matrix error. How can I solve it ? Can you give the csv used in this? The csv file is shared in the post itself. Refer section 6 of the article. Thanks for the great article. Could you pl explain how a VAR and ECM differentiate. I haven’t worked with ECM yet. You can probably put the question on discuss.analyticsvidhya.com so that the community can help you clarify the doubt. Hi! I was wondering about ranges of each column of the dataset. VAR models express every output as a linear combination of other variables weighted in a certain way. So, using absolute values changing in different ranges is probably not a good solution. RMSE high values seem to confirm this. Am I wrong? That’s a good point. Normalizing should reduce the rmse value. Have you tried applying it on this dataset? It was a very instructive article, I have a question on your final prediction. Why do you fit a new VAR model on your whole dataset to make your prediction instead of taking the previous fitted model (with your training set) ? We build a new model for two reasons – Firstly, we must train the model on the complete set otherwise we loose some information. Secondly, the model makes prediction for dates after the training data. If we use only the train set, the predictions will be for dates present on the validation set. what does y in model_fit.y mean ? prediction = model_fit.forecast(model_fit.y, steps=len(valid)) We first fit the model on the data and then forecast values for the length of validation set. I want to forecast the next 30 days then we have not validation set, then what we do? we are not using the validation set here. The only thing is that we are able to compare the results right now, but that won’t be possible with a test set. The article is really great! I have understood the mathematics and reasoning behind the VAR, however, I still have a problem in compiling the same in python and I need basic codes for the same. The complete code is given in the article itself. Let me know which part are you facing an issue with. You can use the data.corr() function to get the correlation between the variables. You can then select or remove the variables. df = pd.read_csv(“AirQualityUCI.csv”, parse_dates=[[‘Date’, ‘Time’]]); i have problem with parse_date function he doeesn’t work. Can i have another fufnction which can permit to parse ‘Date’ and ‘Time’ ? You can read the dataset without using parse_dates, and then later convert the datatype of column from object to datetime using the pd.to_datetime function. How can i visualise the results? You can use the matplot library. Simply plot the actual values and the predictions on the same plot to compare. Hello Aishwarya, I have some doubt please help me out, in my data set there is test data and I want to predict for the test data but in my test data there is no dependent variable so how to predict for the test data? Thank You.